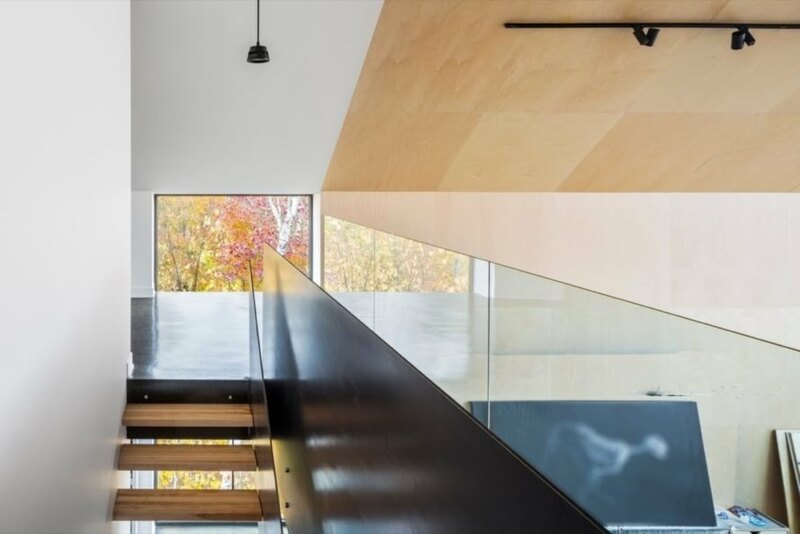 Montreal-based MU Architecture recently completed a minimalist and modern artist studio that boasts dramatic landscape views of Lake Deauville and the Laurentians’ mountainous countryside in Quebec, Canada. Conceived as a multipurpose extension, the Workshop on a Cliff covers more than 5,000 square feet of space and includes two superimposed garages, a workshop, a spacious creative room as well as a mezzanine level. The building is partially elevated on thin pillars so as not to disturb the tree line. Oriented toward the north and views of the lake, the Workshop on a Cliff takes cues from the countryside vernacular with its barn-inspired gabled form. The exterior is clad is pre-aged gray wood, and the thick exterior walls were built to meet the standards of Passive House construction. Overhangs and superior insulation were a must given the harsh climate in this region of Quebec. 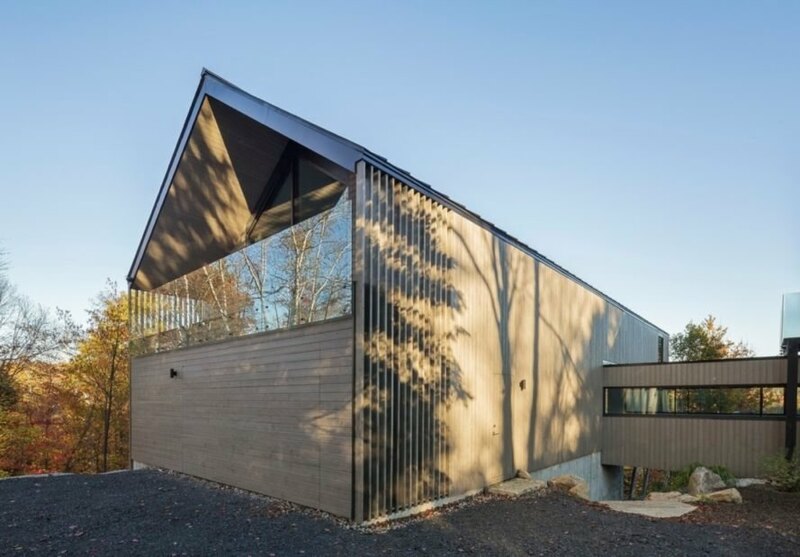 Joined with the main residence by a cantilevered bridge, the artist studio’s connection with the surrounding forest is echoed not only in its timber material palette but also in its series of supporting inclined columns that are arranged to evoke tree trunks. 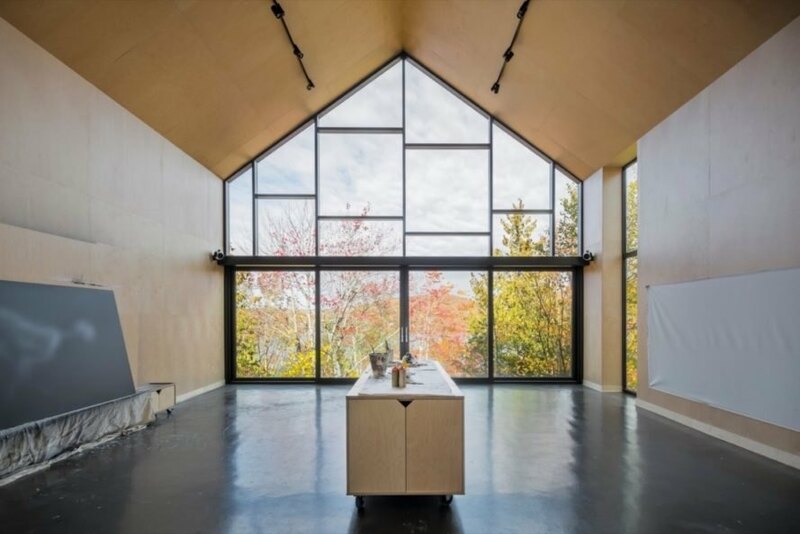 A massive glazed gable end wall is partly sheltered by a roof overhang and lets plenty of natural light and views into the interior, which is mostly open-plan with minimalist detailing to keep the focus on the outdoors. Timber cladding on the interior is paired with highly reflective polished concrete flooring. A mezzanine is set in the rear of the building. 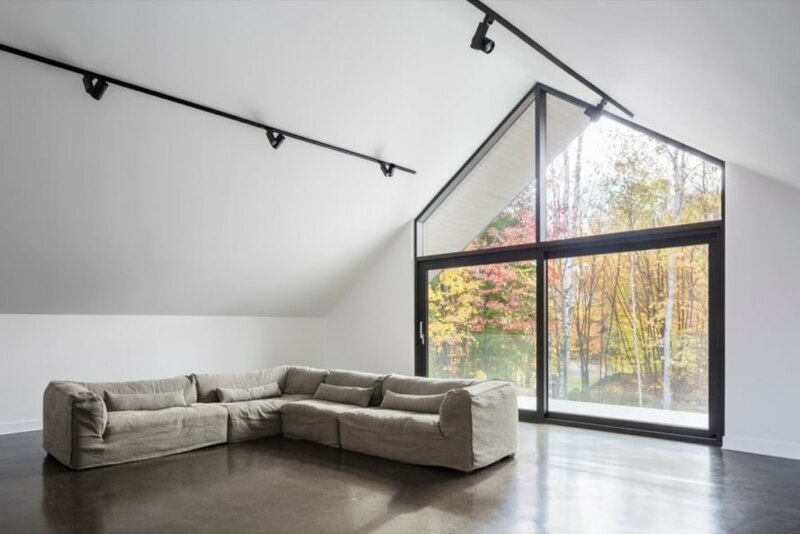 This modern, minimalist artist studio in Quebec includes a workshop, two garages, a creative room and a mezzanine level. The studio, designed by MU Architecture, stands on thin pillars for minimal site impact. The workshop offers plenty of room for creativity. The studio serves as a multipurpose extension. Minimalism is prevalent throughout the design. 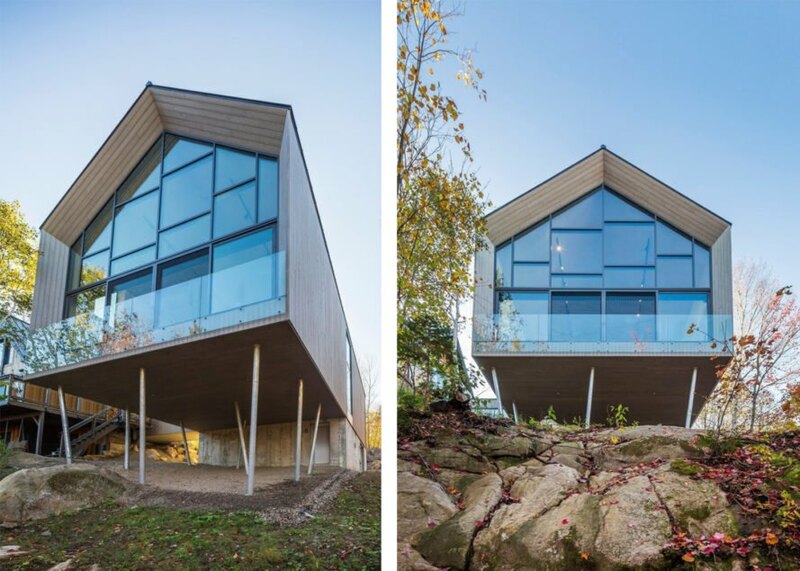 Workshop on a Cliff meets Passive House construction standards while also showcasing a sleek design that connects inhabitants with nature. A look at the studio floor plan.